Nothing's Gonna Change My Love for You EOPM is provided for you and if you think it can be optimized such as adding the dynamics etc, welcome to provide us with the more perfect Nothing's Gonna Change My Love for You EOP and EOPM! Nothing's Gonna Change My Love for You is used as the theme song for The Bridges of Madison County. 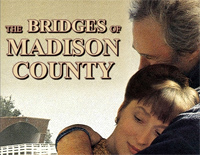 The Bridges of Madison County is a 1995 American romantic drama film based on the best-selling novel of the same name by Robert James Waller.